In my Yakuza Kiwami preview, I talked about how the remake might feel a little too familiar to fans that played the excellent Yakuza 0. That definitely won’t be the case for Yakuza 6: The Song of Life. The sixth main entry in the series is the gigantic improvement that fans have been waiting for, and is the first Yakuza game that plays as good as the story it offers. As soon as I had control of series’ protagonist Kiryu and was walking around Kamurocho, I could immediately tell that things had changed for the better. Running on a completely new engine, the game managed to wow me with its enhanced graphics. The neon lights of Tokyo really stuck out in particular, and it was such a drastic change that it made an area that I had spent hundreds of hours exploring in previous games feel new again. It’s so refreshing to see the series no longer restricted by the dated PlayStation 3 hardware. Beyond the new look, Yakuza 6 also shows that the series is finally embracing modern ideals. Despite being a fan of Yakuza, there’s no denying that it sometimes felt archaic and stuck in its own ways. That isn’t the case anymore as progress no longer has to be saved at phone booths. Instead, an auto-save will make sure that players don’t have to worry about such trivialities. Losing hours of progress due to not saving is a relic as old as telephone booths themselves, so it’s almost a symbolic gesture to get rid of them. Another long overdue feature is the ability to add waypoints to the map, so now getting around the complicated streets is easier than ever before. While the graphical improvements were immediately noticeable, I didn’t know just how big of an upgrade The Song of Life was until I got into my first fight. Combat in the Yakuza series has always been enjoyable (I’ll take any excuse I can to swing a bicycle at pedestrians), but it’s been undeniably stiff in the past. All of that rigid movement is gone, as Yakuza 6 feels incredibly fluid. I was able to pull off every idea I wanted to in combat, be it picking up a traffic cone or slamming a bad guy into the wall of a nearby restaurant. The biggest, and coolest, change to the combat is that it’s now a completely seamless experience. No longer can Kiryu run inside a store to avoid combat, as foes will follow him in there (with zero load times) and start causing mayhem inside the store. This ends up being as awesome as it sounds, as I lured some gang members into a convenience stores, and then caused more financial damage then any robbery attempt ever did. The store was such a wreck after I had throw baddies into every row of food that I was forced to leave by the employees, and a construction sign was placed upon the sales floor. The combat is more ridiculous than ever in Yakuza 6, and I absolutely adore it. Despite all of the core gameplay seeing massive improvements in The Song of Life, the narrative scope is being scaled down a bit from past entries. Both Yakuza 4 and 5 had players controlling a handful of characters in different locales, but this game is all about wrapping up Kiryu’s story. As such, the “dragon of Dojima” will be the only playable character, and the story will be limited to two locations: Kamurocho (which I got to see) and Hiroshima. I didn’t have time to check out the game’s core narrative, but I did get to wander the streets of Kamurocho and get into some of the series’ signature side-quests. When I opened up the game’s map to survey the area, I was surprised at just how many different stores were available to go in. It far outweighs what Yakuza 0 offered up, and I ended up going to the local gym to make sure Kiryu was in fighting shape. Once there, I met with my personal trainer, and chose to do two of the several workouts available to me. These were simple mini-games that just required me to press buttons in succession, but nonetheless, I got to see Kiryu’s form as a weightlifter. After I was done hitting the weights, my personal trainer recommended that I eat a specific type of beef bowl (one with lower calories) at a local eatery. Following his advice, I ordered the item, took a picture of it with Kiryu’s cell phone, and sent it to my proud trainer. Afterwards, I got to see a result screen that showed how in shape Kiryu was. It’s just one of the silly things that The Song of Life has to offer, but I loved how it forced me to try a new restaurant that I might not otherwise check out in the game. After getting my hands on Yakuza 6, I feel as if I’ll have a harder time enjoying Yakuza Kiwami when it releases later this year. It really is so much of an upgrade that it’ll be difficult going back to the more rigid gameplay that defined the series on PlayStation 3. 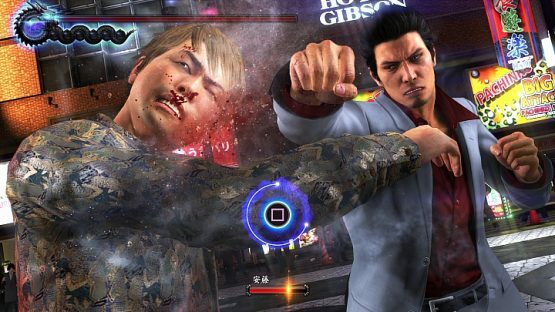 The Song of Life proves that SEGA still can do a lot more with Yakuza going forward, as it has gotten new life thanks to the cutting-edge engine finally taking advantage of the more advanced hardware. Yakuza 6: The Song of Life is set to release in 2018 for PlayStation 4. Previewed on PS4.